This month has gone so fast, and I am getting more excited for summer. 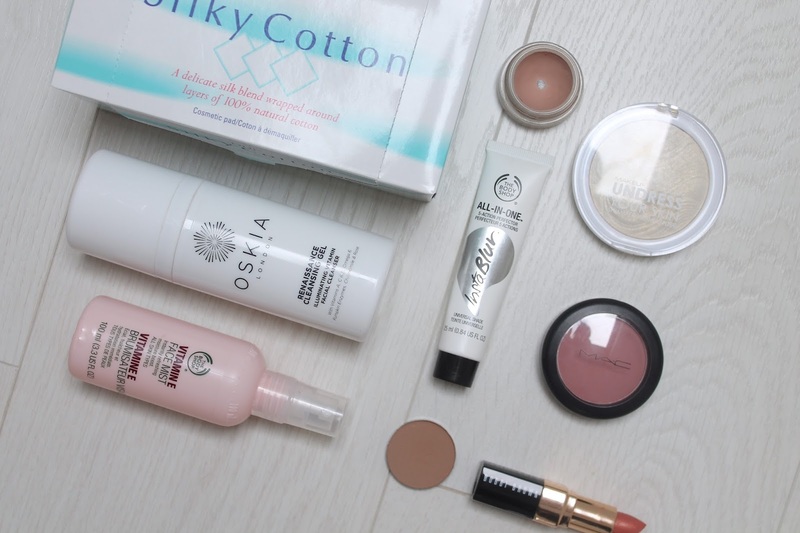 This month has seen me reach for expensive cotton pads, neutral shades and good ol’ old favourites. I have been using the DHC Silky Cotton pads (£4.50) almost every day throughout May, they are so incredibly soft on the skin. The are double sided so one pad does both eyes, they have lasted me such a long time and I will defiantly be repurchasing them when I finish them. I have talked about Oskia Renaissance Cleansing Gel (£28) on WLL a fair few times. I have been using this in the morning to refresh my face and also as a quick cleanse in the evenings. Another product that I love a lot is The Body Shop Vitamin E Face Mist (£8) I use this as the last step of my skincare routine and before my makeup. It is so refreshing and smells so so good. Painterly Paint pot from Mac (£15.50) has been a firm favourite of mine ever since I brought it. As you can see from the photograph above, I have hit the bottom of the pot. I have only just done this and I have had this product for a very long time. The body Shop All-In-One Insta Blur Primer (£14) this primer has been a part of my everyday makeup routine for ages, it blurs imperfections and keeps my makeup on almost all day. I have been loving contouring this month and my favourite contour product is the shade Fawn from the Anastasia Beverly Hills Contour Kit (£39). Its the perfect shade for my skin tone and I love it for an everyday contour. I have been loving highlighting the tops of my cheekbones and brow bones this month and my favourite to do this has been MUA highlighting powder in Gold (£3). This highlighting powder is so pigmented and for the price it is so good. It looks beautiful when the sun catches the light. A new purchase this month was Mac blusher in Mocha (£18). This has been sold out in every single Mac store I have visited, I finally tried to track it down and oh my goodness it is gorgeous. I have been wearing this shade everyday throughout May. I recently received the best parcel from Dave Lackie, he sent me the Bobbi Brown Sandy Nudes Collection and I have done a review here. I have been wearing the Lipstick Pink Gold Shimmer (£19.50) it is a very summery shade and I have been loving it this month. Whats been your favourites for this month?